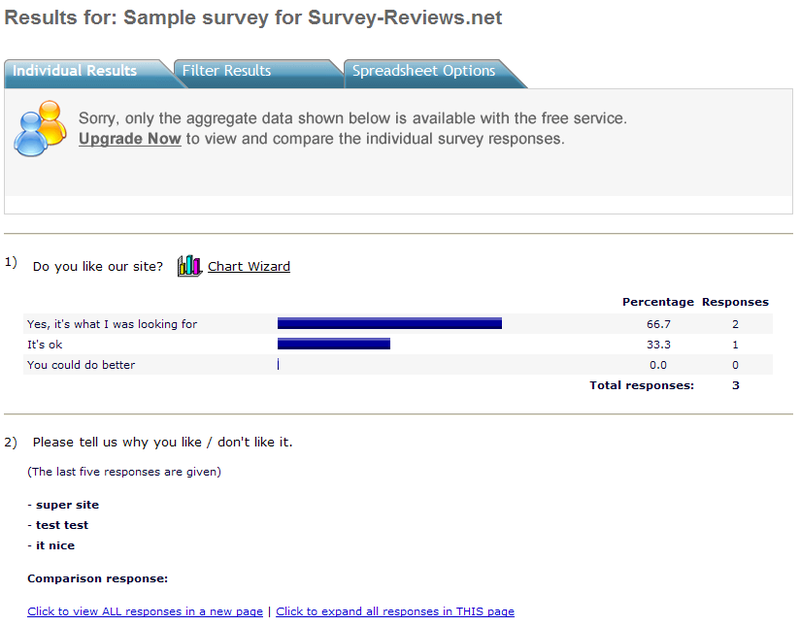 Searching on Google for free online surveys will invariable display FreeOnlineSurveys.com as the first result. 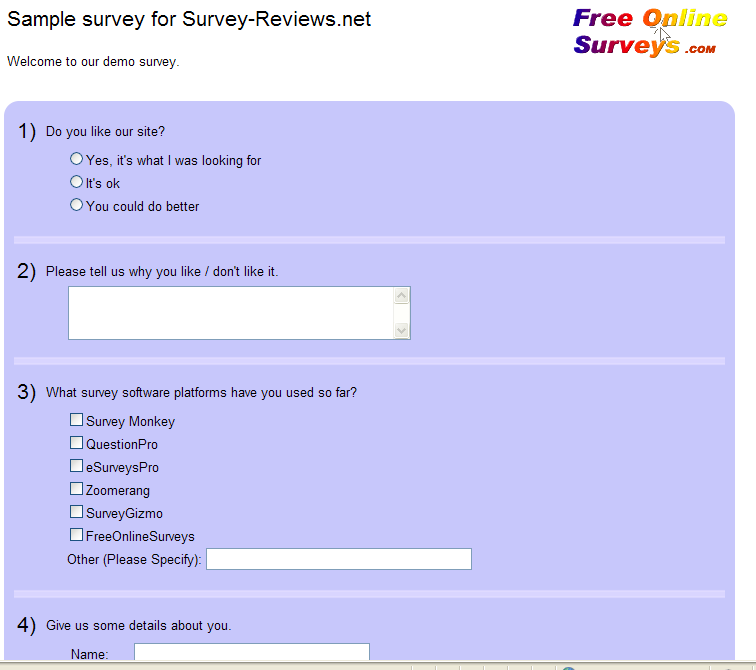 We will try to have a look at this survey software platform to see how good and how free it is. The site is not too informative, so we will need to create an account to find out more details related to the features they offer. Registration appears to be done right on the front page, just by entering you name, password and email. That was too easy. So, the main limitations are 50 responses per survey and 10 days per survey. 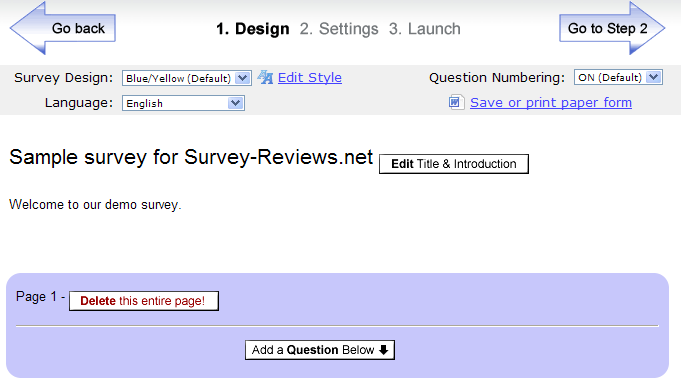 No so much a “free online surveys” site. We will start creating a new survey now. The user interface seems rather old and rudimentary. However, there are several predefined styles that you can choose from and you also have the possibility to choose the language of your survey. That’s a nice feature. Let’s add a few questions to our survey now. 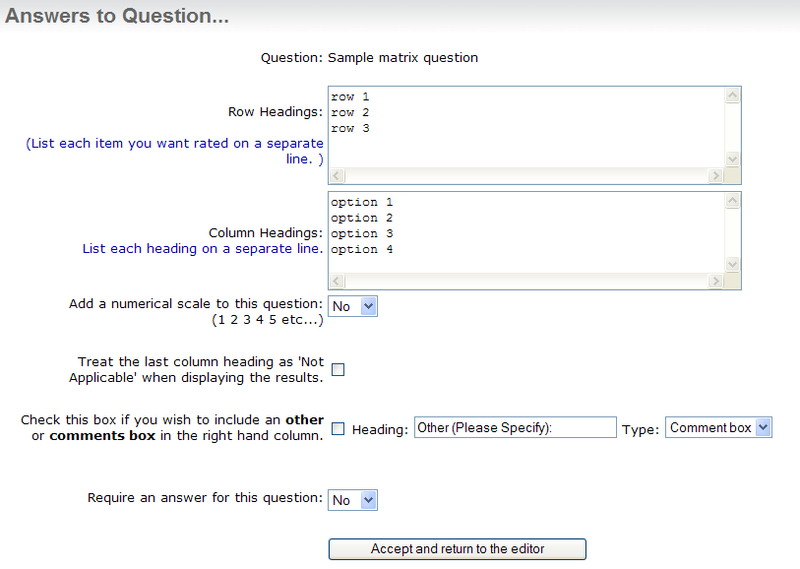 Clicking on “Add a question below” button sends us to some sort of wizard to begin adding the question. 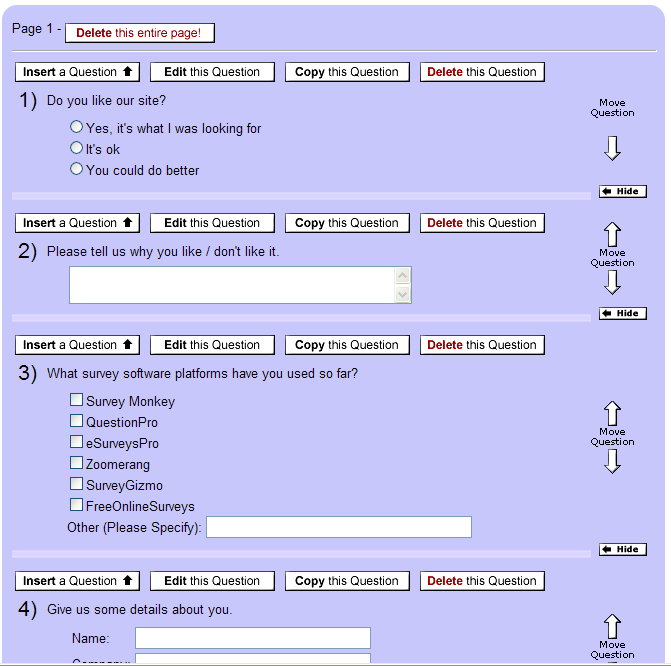 In this first screen, you can choose the question type and enter the question text. At the first look, seems like very few choices here, especially if you take into consideration that “Simple (true or false)” and “Simple (yes or no)” are also single choice questions like “Multiple choice (choose one of the following)”. A nice thing is the presence of the rich text editor for the question text. The second screen of the add question wizard finally allows us to add the answer options for the question and also setup some other things. Possibility to add an other or comments box to the matrix question. For each question, you can edit it, delete it or copy it. Questions can also be moved, but only 1 position up or down. 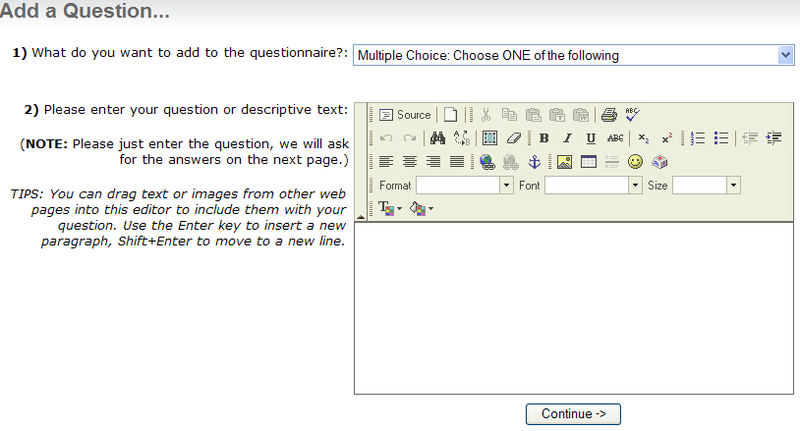 That could be kind of hard if you would like to move your question 3 pages down for example. Again, very few options for the free account. You can only see a summary report. You cannot view individual responses, filter or download results. The only nice thing for the free account seems to be the possibility to generate custom charts for multiple choice and matrix questions. 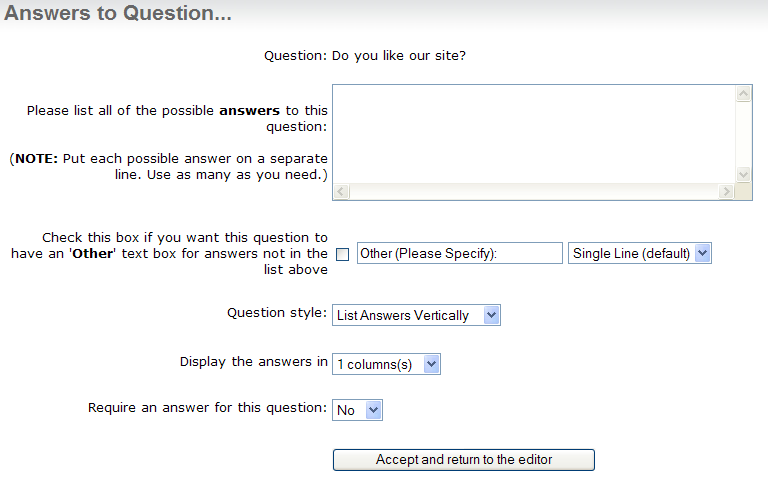 This is the MOST RESTRICTIVE “free” survey platform available on the internet. It really should not be called “free” because there is not much you can do with the “free account” that they give. Thanks for your reviews. They were very helpful. After skimming through all of them I think I will go for QuestionPro, because it aparently offers the best instruments for analyzing the answers. I used this site for my university survey. I paid the monthly amount for more options – you can’t really use this as a free survey for a degree. Oh and I say ‘monthly’ because once you pay, they will continue to take the fee out monthly until you cancel. Although the questions look good and are flexible, I had a major technical problem when I tried to change the wording of one of my questions. They do warn you not to change the type of question, but I just change the wording. This made it so I could no longer view the completed surveys individually. And the ‘tech’ support was useless. I have read several good stuff here. Certainly price bookmarking for revisiting. I surprise how so much effort you set to create this type of excellent informative web site. I used this tool for a work effort with our executive team, and I will say this was a horrible experience. Here is what happened. 1. Multiple users that filled out and completed the survey did not have their answers recorded. I physically watched as two collegues finished the survey successfully, and then went to find their answers in the results of the survey, they were not recorded. Our CEO was also unable to get his answers logged, after asking him to complete it again!!! Which looked bad on my part. 2. Emailed customer service for help, and was given the answer that it’s not “us” it must be “you”. Not only was that the response, but the customer service rep filled out the survey and destroyed my results by entering 1’s on all my matrix questions which mean’t I could not use any of the graph tools to at least show the data I collected. 3. After sending a longer email detailing my issue and sending a more thorough report of the issue, I was never sent an email back. So in other words they ignored me! 4. The 10 day trial is done, and I can no longer access the data which is due because of the products inability to deliver results, not because I was unprepared to get all of my data out in the 10 days given. Conclusion: We are looking for a tool to help us with assessment and strategy planning surveys with our customers. There is absolutely “ZERO” chance that I would use this tool. The graphs, charts etc do not work! Their knowledge base is in fact their wish list of things they will do some day. and I am paying to extra upgrade by the way..